The archipelago of Fiji is a well known holiday destination, famous among sun worshippers for the warm azure waters, powdery white sand beaches, languid pace and welcoming culture of its islands. Stretched out to the northwest of Fiji's main island is a stunning group of small volcanic islands - the Yasawas. Unspoiled, uncrowded, sparsely populated and spectacular, with no big resorts, shops or roads, the Yasawa Islands are something out of a tropical fantasy. With their palm-studded white sand beaches, rugged jungle-clad hills and placid turquoise waters teeming with coral reefs, the Yasawas are superbly suited to kayaking adventures. 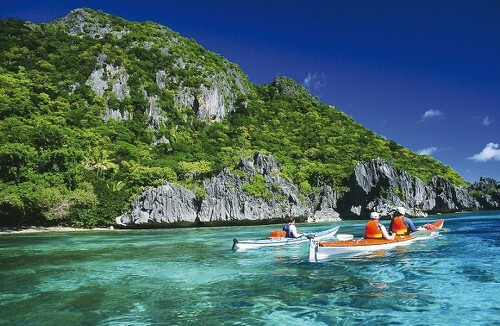 Join us for an unforgettable journey as we kayak between the secluded islands of this spectacular archipelago! 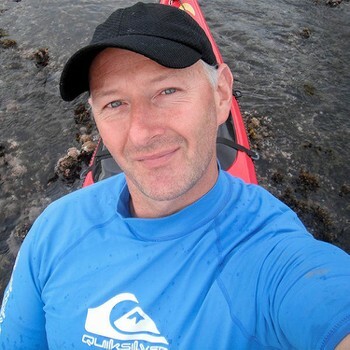 Paddle between the remote islands of the northern Yasawas on modern expedition-style kayaks, through crystal clear waters filled with corals and colourful sea life; stopping frequently to swim, snorkel and picnic on the powdery white sands of deserted beaches. Camp on a new beautiful island each night, and engage with Fijian culture, history and tradition as you meet famously friendly locals in small island villages. 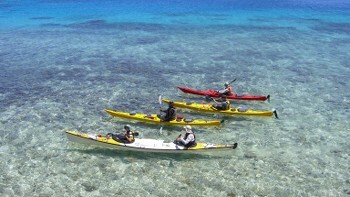 Take a look at our unique Yasawa sea kayak adventures and join us as we explore this incredible chain of islands! 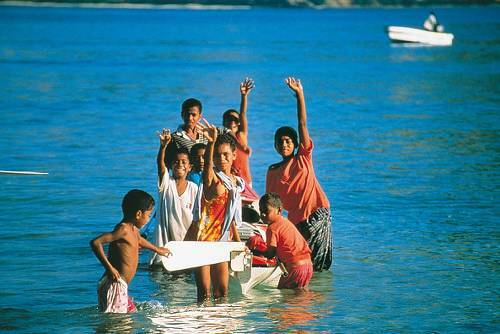 Be welcomed by the friendly Fijian villagers of hte Northern Yasawas and observe their local way of life. 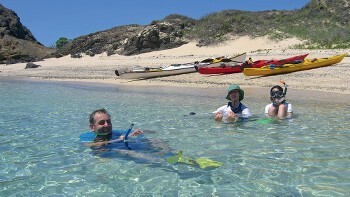 After a hard day's paddling spend your leisure time either snorkelling, exploring or relaxing. Our Fiji kayaking adventures offer ultimate value for money as we take care of all the logistics, allowing you to simply focus on having an amazing experience. We aim to incorporate as many inclusions as possible in the tour cost such as most meals, kayaks and safety equipment and group camping gear. 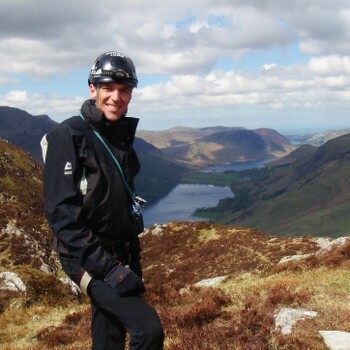 Our enthusiastic and friendly kayaking guides have many decades of experience leading trips and their expertise ensures a safe and comfortable holiday. Passionate about the warmth and hospitality that is central to the Fijian way of life; they look forward to introducing you to the tropical wilderness of the Yasawas. Responsible travel practice is at the heart of our Fiji program. When you book one of our adventures you're supporting the protection of natural environments and sustainability in remote island communities. We pay a per person, per night camping fee to the communities of Navotua and Tavewa, providing them with an important source of income. When water is scarce on a particular island we will bring extra water in on our boat from the mainland. Additionally, we supply all of our own food to ensure we do not deplete resources on the islands. We use local boats, employ local guides and include traditional Fijian dance and music experiences into our itineraries. Generally you will experience a mild tropical climate from May to November. Nights will be cool, perhaps 16-20oC, with some spells of cloudy weather and rain. The days are generally hot and dry, with humidity increasing in October and November. The Trade Winds blow from May to November (light to moderate winds from the east and south-east). Credit cards are accepted in larger stores or hotels, but do not rely on being able to use them everywhere. Electricity in Fiji is 240 Volts, at 50 hertz. The most common pin type is I. (Aust - 3 flat prong).